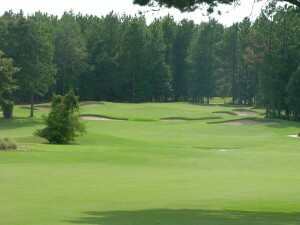 Although it is out in the middle of nowhere in the Piney Woods of East Texas 90 miles from Dallas near Frankston, the Pine Dunes Resort & Golf Club has collected an amazing array of accolades since opening in 2001, including even being named the best in Texas open to the public and near the top of all the different rankings. While it is difficult to live up to all of the hype from the national media, especially pro golfer David Frost’s comparison of Pine Dunes to Augusta National and Pine Valley, two of the best in most rankings of courses in the United States, there is no doubt that Pine Dunes is deserving of its reputation as a peaceful getaway with a championship-caliber course, similar to ones found in the Sandhills of North Carolina. Even general manager Chris Edmonson noted that when visitors drive up for the first time that “we might not have the curb appeal” expected when they have heard resort as part of the name. “But I’ve never had anyone leave and complain about the course,” he noted. Jay Morrish crafted some interesting contoured fairways on the rolling sandy terrain with majestic century old pine trees bordering them, creating a par 72 layout that can be stretched to 7,117 yards with a course rating of 74.4 and slope of 131 from the back tees. It’s more player friendly from the blues (6,537, 71.3, 126), whites (5,819, 68.1, 119) and reds (5,150, 72.0, 127). Be ready for a challenge right out of the gate as your first tee shot has to be hit to one of the narrowest of the fairways between trees, but there is plenty of room on the next hole, a drivable par 4 for the long hitters, where there are no trees in the landing area. The par 5 5th holes features a split fairway, giving golfers a safer route if they stay between trees to the right where it will require three shots to get home. The second shot needs to go far enough to provide a clear shot at the green as the trees can block you out if you do not. Long hitters, or ones who play it forward from the whites as I did on my third chance, can try to clear a large sandy waste area down the left side off the tee, giving them a chance to get home in two or leave a short pitch to make birdie as I did. The 6th is a picturesque par 3 that plays from 126 to 254 yards downhill to a large green protected by a large bunkers on the hillside short and right and another large bunker on the left that catches a lot of balls since the slope kicks shots in its direction. Morrish crafted an interesting array of other holes, none that really look like another. There’s another drivable par 4 on the 15th, but trees on both sides can lead to big numbers if a player’s drives hooks or slices too much as mine did the first time. A wiser course of action is an iron off the tee, leaving a wedge shot for your chance for a birdie. Water does come in to play on four of the last six holes, including the par 5 closing hole that measures only 512 yards from the tips—a hole that even the architect sounded like he would have liked a mulligan, mentioning he needed more room. There is a large hazard at the turning point on the dogleg right that most long hitters have no problem carrying and having short iron second shot, but risk hitting into a large bunker on the right if they take a safer route to the right as I did from the whites. I still only had an 8-iron then and the second time I played it from a yard short of the sand. One suggestion is to make it a par 4 for championship play like the Northern Texas PGA did, maybe even moving the tee up to either 434 or 480 yards. Then keep it a par 5 for regular play for men by moving the whites and blues to 480 and 512 yards. Owner Jodi Lutz says the original 18th hole had more teeth as there were two large trees that prevented golfers from taking a more direct line toward the green. The trees were the victim of lightning, however. Lutz noted some of the regulars were “cheering” after this happened. 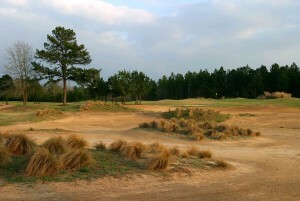 Pine Dunes is definitely a great value with rates of $59 Monday through Thursday and $79 on Friday-Sunday and holidays. Seniors, like the couple from Dallas we met, get a $10 break Monday through Thursday. There are 10 modest, but comfortable condo units just down from the 18th green that can sleep up to 40. It’s operated separately with room rates from $124 in the summer and winter to $225 in the spring and fall. 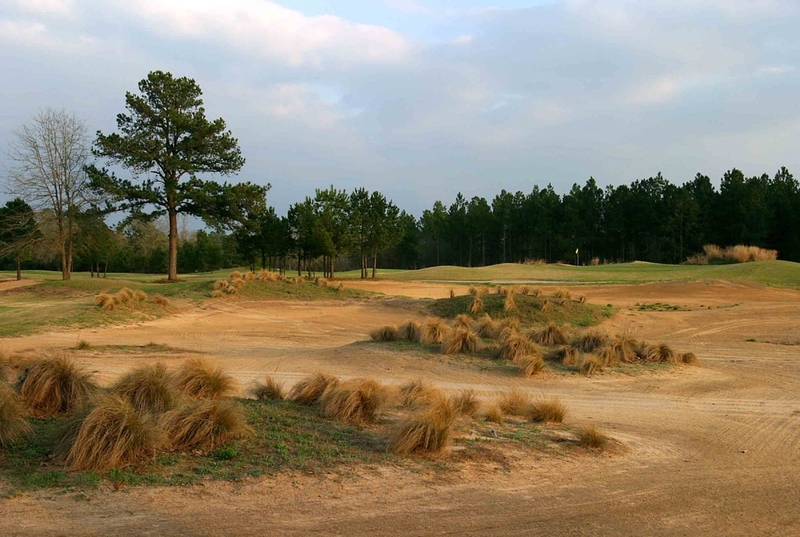 Lutz noted that Pine Dunes was a great place for a guys trip as they can play all the golf they want, cook steaks out on the grill, drink beer and play poker into the wee hours of the morning. Some groups even book a year in advance, especially in April, May, September and October. When Lutz bought what was the 9-hole Dogwood Trails golf course in 1994, she never envisioned a hidden diamond in the rough like Pine Dunes has turned into. She moved her parent from Minnesota to manage the facility. A chance meeting with Frost in the spring of 1996 after a hockey game resulted in him visiting. Lutz admitted she was embarrassed to show it to him at first, but finally did. Frost felt it reminded him of the Pinehurst area and though she should think about upgrading the place. Frost got Carter Morrish and his dad Jay to come take a look. They were just as excited about what could be done on the property and suggested she consider getting financing to handle major renovations. Two years later, Lutz had acquired more nearby property and made that call, getting the elder Morrish to accept an unusual business arrangement, paying his $750,000 fee in monthly installments. Morrish agreed, saying he felt the project had great merit. Jay’s minimalist instincts, where only 100,000 cubic yards of dirt were removed, along with the natural topography helped hold construction costs to $3.75 million. Looking for a new name for the facility, Lutz first came up with Porky Pines, but Morrish quickly asked her to re-think the name. That’s when she came up with Pine Dunes, for all the pines and sand dunes on the property. Lutz added Resort to the name, thinking ahead that she would indeed expand the lodging options to look more like what most expect when they hear the word resort. She hasn’t given up on this idea, pointing to future plans for a 40-room Boutique hotel. And it’s definitely a golf club, with only a small 19th hole for breakfast and sandwiches. The Pine Dunes story is even more remarkable when you consider that Lutz has never had a marketing budget, instead putting money back into keeping the course up to the high standards golfers expect. She relies on word of mouth advertising and the great reviews from local and especially national publications. “I’ve been fortunate to have had a lot of people helping me,” she added.